Discrimination & prejudice toward migrants & refugees is frequently discussed transnationaly with good reason. Individual & institutional racism is a historic & current problem in all member states and with recent increases in migration there is evidence a significant rise in racist incidents. Those working with migrants & issues of racism are increasingly aware that the ER form of discrimination has not received attention, despite a clear negative social impact. Due to underlying manifestations of racist & prejudiced attitudes & discrimination, it is easy to overlook the ‘everyday’ aspect unless you are a member of a recipient group. Even within recipient groups there may be lack of recognition; many don’t talk about it & may justify it by blaming themselves for not being “integrated” enough or being “different”. The self blame process is not dissimilar to the experience of those who are bullied. Research carried out by ICI in Iceland in 2012 showed that 93% of participants with non-Icelandic background experienced some hidden prejudice & discrimination once or more during a 14 day period. 62.5% of participants experienced some form of hidden prejudice & discrimination 5 times or more during the time period, compared to only 5.8% of an Icelandic group. A similar transnational survey was conducted in 3 other EU countries as part of a Leonardo project, ERAW, which showed a similar outcome. This Icelandic research & associated surveys from the ERAW project & the associated literature reviews provide the research base & rationale for INAR. You can read more about the research here. 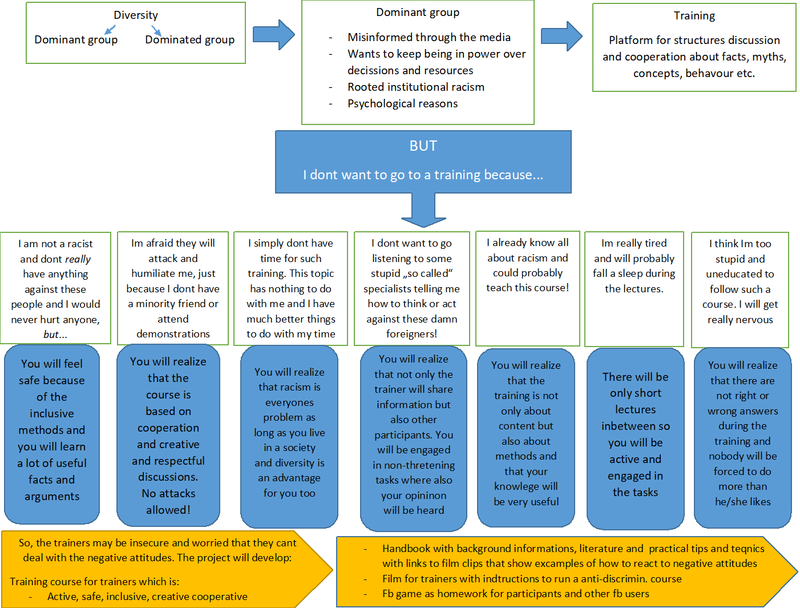 The framework of a Erasmus+ KA1 project shows that adult learning is complex & it is often difficult to reach adults with the provision of training on controversial issues like racism, prejudice or discrimination. INAR’s goal is to use cooperative learning material, instruments & tools to create a positive & interactive learning environment suitable for a diverse group of adults. As the adults may be obliged to participate by employers/managers, unemployment offices etc, it’s important to develop inclusive, non-threatening methods & materials that give each participant space to interact & discuss their ideas, but at the same time obtain the correct information concerning facts, experiences & feelings of those exposed to ER. As the project develops we will add the developed support material onto this webside as well as to our organizations websites. This material will be published under “support material for trainers”.